Help people relieve stress with custom printed plastic mood cards. These plastic cards feature a heat sensitive area that changes color and have tips on the back to help reduce stress. You can imprint your brand or custom artwork on the back of the card at an affordable low price. What's nice about these plastic mood cards is that they are the size of a credit card, so they can be tucked in a wallet or pocket and carried anywhere. Promotional plastic mood cards are great give aways to be handed out or used in goodie bags at a variety of events, like trade shows, conventions, parades, fundraisers, health seminars, and more. 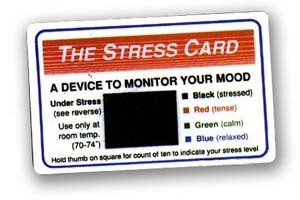 Plastic stress card to monitor your mood, has a 1" x 3/4" stress indicator with a choice of stress abatement directions on back, .030" thick. Pricing Includes: a one-color silk-screened imprint.